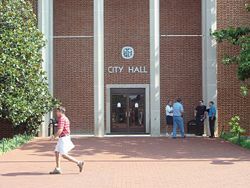 Coordinates: 38°01′49″N 78°28′38″E﻿ / ﻿38.030287°N -78.477252°W﻿ / 38.030287; --78.477252 The Charlottesville City Hall is located at 605 E Main Street, on the east end of the downtown mall. Charlottesville City Hall is located in Downtown Charlottesville at the east end of the pedestrian mall across from the Downtown Transit Center and Charlottesville Pavilion. The building houses administrative offices for the City of Charlottesville, and is the location for City Council, Planning Commission, and other public meetings and hearings. 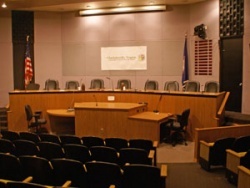 City Council Chambers is the meeting room in City Hall that the Charlottesville City Council uses for its regular meetings. It is on the south side of the building. In addition to the City Council meetings, many public events are held in Council Chambers. Bsmt Conference Room – Basement, Charlottesville Redevelopment and Housing Authority (CRHA). Entrance from Main Street via stairs or elevator down. 1st Treasurer, Treasurer – Customer Service Lobby, General Information, Payments of Fines, Fees, Utility Bills, & Taxes, Purchase of Dog License, Purchase of Zoning Parking Permits & Trash Decals, Utility Billing, Finance, Commissioner of Revenue Business Licenses, Meals and Personal Property Tax, Transient Occupancy Tax, Virginia Sale Tax and State income Tax, Real Estate Tax Relief for the Elderly and Disabled. Entrance from Main Street to Lobby Area. 2nd City Attorney, Human Resources (Job Applications), Conference Room – 2nd Floor, Clerk of City Council, City Manager & Communications Offices, City Council Chambers & Press Gallery, Community Development Block Grant (CDBG)/Housing, Economic Development, Neighborhood Development Services (NDS) - Engineering, Planning, Property Maintenance, Traffic Engineering, Zoning. Entrance from Main Street via stairs or elevator up. 3rd Commonwealth Attorney, Victim and Witness Assistance, Assessor. Entrance from Main Street via stairs or elevator up. ↑ Print: City Report Shows Wide Range in Expansion Costs, Ray McGrath, Daily Progress, Worrell Newspaper group September 4, 1978, Page . ↑ Print: Council Okays Bare Minimum, Ray McGrath, Daily Progress, Worrell Newspaper group September 6, 1978, Page . This page was last edited on 1 November 2018, at 22:06.